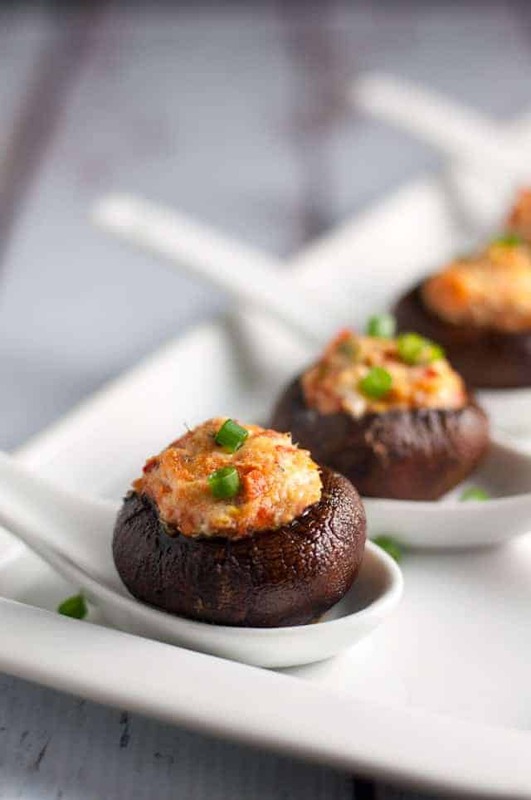 With creamy goat cheese spiked with lemon, onion and dill and a little heat from dried red peppers, these little Smoked Salmon and Goat Cheese Stuffed Mushrooms make perfect appetizers or finger food. 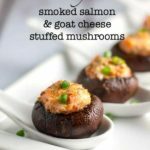 These Smoked Salmon and Goat Cheese Stuffed Mushrooms should definitely be served at your next party. I decided yesterday that the internet needs another stuffed mushroom recipe. I’m starting a one-woman campaign to bring back the stuffed mushroom craze. Why? First and foremost: they’re good. Secondly, they have a convenient little cavity for holding all that cheesy goodness. When you’re like me and you’re trying to avoid gluten in your diet, you’re automatically denied those delicious little canapés that sit on top of a cracker or a thin crispy crostini. My alternatives have been to use a slice of pear or apple in place of a cracker when I make finger food, but today, I’m all about mushrooms. 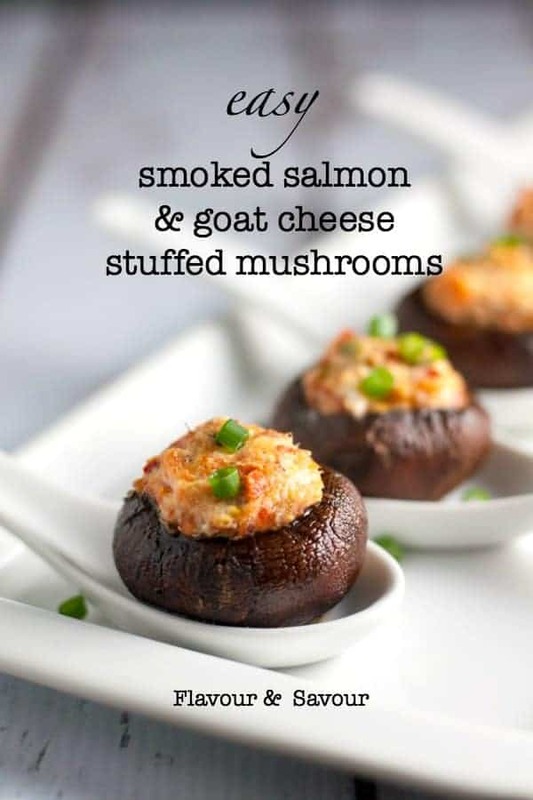 Specifically, these Smoked Salmon and Goat Cheese Stuffed Mushrooms! 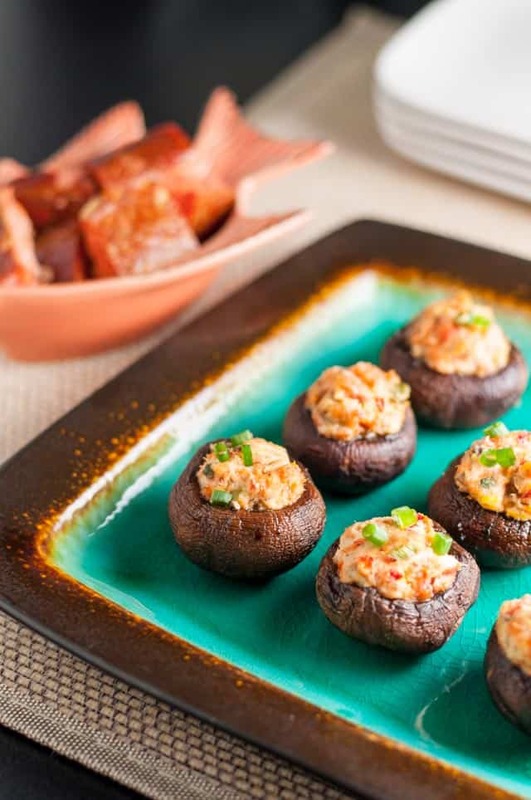 Mushrooms with smoked salmon, that is. Denis received a new electric smoker for Christmas so he got busy experimenting with a new recipe, using some of our wild-caught sockeye salmon we had frozen earlier this year. Smoked salmon is like gold to me, and I like to stretch it to make it last. This finger food smoked salmon recipe uses just a tad, but it packs a lot of flavour into one little mushroom cap. With creamy goat cheese spiked with a little lemon, onion, and dill and a bit of heat from dried red pepper flakes, these are tasty little morsels. 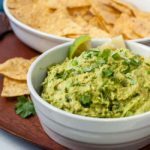 They make perfect appetizers or game-day snacks. 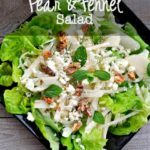 Add a little finely grated Parmesan on top, or omit it to keep these dairy-free. 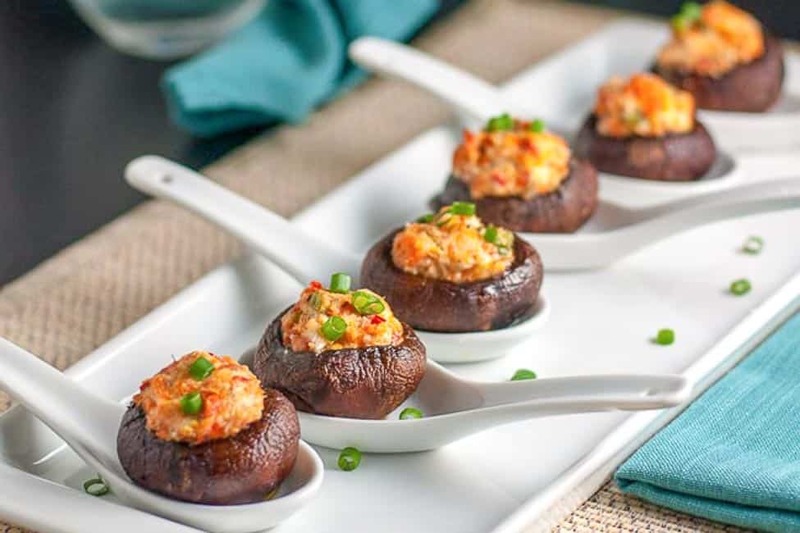 But don’t leave out the two secret ingredients that put these goat cheese stuffed mushrooms over the top: smoked sea salt and lemon-infused olive oil. Those two pair up to become the crowning glory on top of all that goat cheese stuffed mushroom heaven. 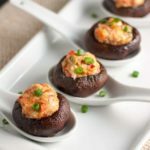 So, are you ready to jump on board my stuffed mushroom train? 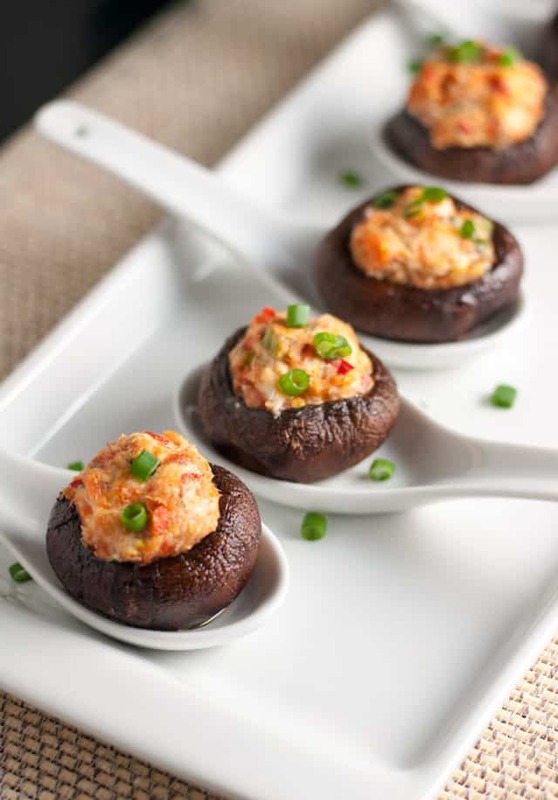 Hop on and try these Garlic Lovers’ Blue Cheese Stuffed Mushrooms, too! These Smoked Salmon and Goat Cheese stuffed mushrooms are an easy appetizer, perfect for parties year round. Gluten-free, too! Heat oven to 350°F. and line a baking sheet with parchment paper. Remove mushroom stems and wipe mushroom caps. In a small bowl, thoroughly combine goat cheese, mayonnaise, Parmesan, smoked salmon, lemon zest, chives (or green onion) red pepper flakes, and dill. Place mushroom caps on baking sheet, drizzle with a little olive oil and bake for 25 - 30 minutes. Remove from oven, stuff with 1 tablespoon of the goat cheese and salmon mixture. Return to the oven for 6 - 8 minutes until filling is hot and golden. Remove from oven. Garnish with a drizzle of lemon-infused olive oil and a pinch of sea salt. 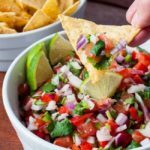 Find more recipes for appetizers and finger food here. Stuffed mushrooms are one of my all time favs. Always can use another recipe for them. Thanks Amie! I’m glad I’m not the only one who loves these! We made these on the weekend……delicious! We used some canned smoked salmon that Bill did last summer and it worked well. 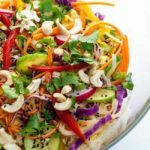 Thank you for all of your great recipes. I make one of your chicken dishes at least once a week. Thanks Sandra! Mmm–home-canned salmon. There’s nothing quite like it. So good! Thanks for your kind comments! You’re welcome! Thanks so much for commenting!